Blog > A Postcrossing mixtape! I came across Postcrossing by chance at home one evening. I was reading about Bookcrossing which I have done a bit of in the past when I stumbled upon Postcrossing. 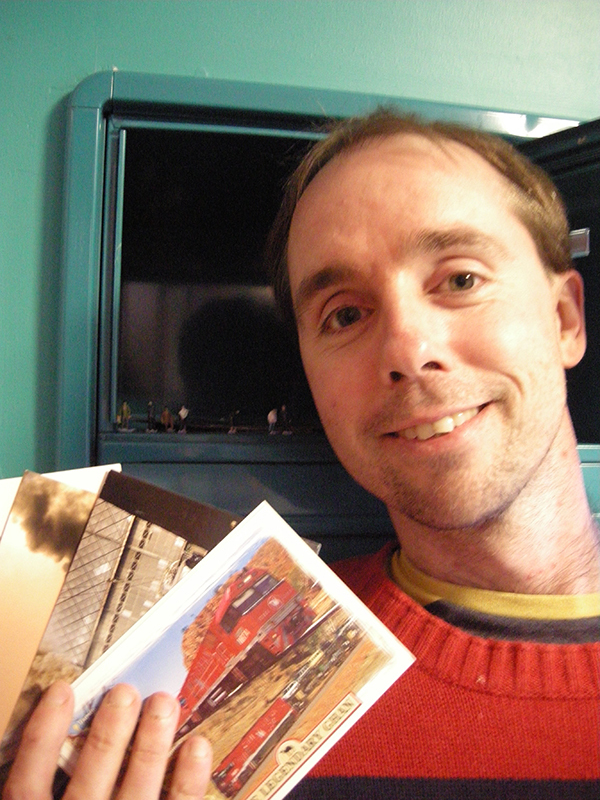 As a lover of snail mail I was instantly hooked on the idea and signed up to begin sending postcards. I read some other users accounts and got a sense of how to set out my own ‘who i am and what i want’ profile. I thought about the kinds of postcards I’d like to receive and additionally I considered what I would like to perhaps learn from fellow Postcrossers. I have quite a lot of music on CD and cassette tapes. I don’t collect vinyl. My radio is hardly ever off. I decided that I really wanted to learn more about music from other parts of the world and that Postcrossing would be a good way to help me learn about it. My profile reads… ‘I like to learn about different types of music from all over the world. Please tell me about your favourite music from your home country / city / town.’ And on postcards I sent out across the skies I wrote words to a similar affect. Often I would tell people what I was listening to that day or about my favourite bands (Breed 77, Beach House Joanna Gruesome, etcetera…). The responses I had from Postcrossers did not disappoint. There were those who wrote about musical instruments they play, or what genre of music they enjoy. One from Netherlands wrote about how they could hear children going from door to door singing songs and collecting candy as part of traditional Saint Martin’s Day celebrations (11 November). And I started to learn as I had hoped about lots of genres of music I had never heard of (or considered) such as Medieval Rock (Saltatio Mortis), Mandopop (JJ Lin), Slovakian punk (Horkýže Slíže), Daina Baltic Folk (Alina Orlova), Russian Folk (Пелагея). And as time went on I started to think about what I would do with my new found knowledge. Eventually I decided that I would make a mixtape of various Postcrossers’ favourites. Once I reached 100 postcards I selected one from each postcrosser who wrote to me or replied about music. I chose to not include bands whose music is familiar to me such as Abba or the Bee Gees – not just because I don’t like them but my aim with the project was to discover music that was new to me. And importantly I wanted that music to be an international portrait of Postcrossing members’ diverse tastes. And as I used to do so much in my teens, I taped the music onto cassette. This is the only physical copy of the postcrossing playlist. I painted it with a small (inaccurate) map of the world on one side and on the reverse is a postcard including a real stamp. The mixtape exists as two playlists on Spotify. One side (playlist 1) featuring music from postcards I received and the second side (playlist 2) featuring songs from replies to postcards I sent. Side 1 plays 47 minutes, and side 2 runs for 43 minutes. 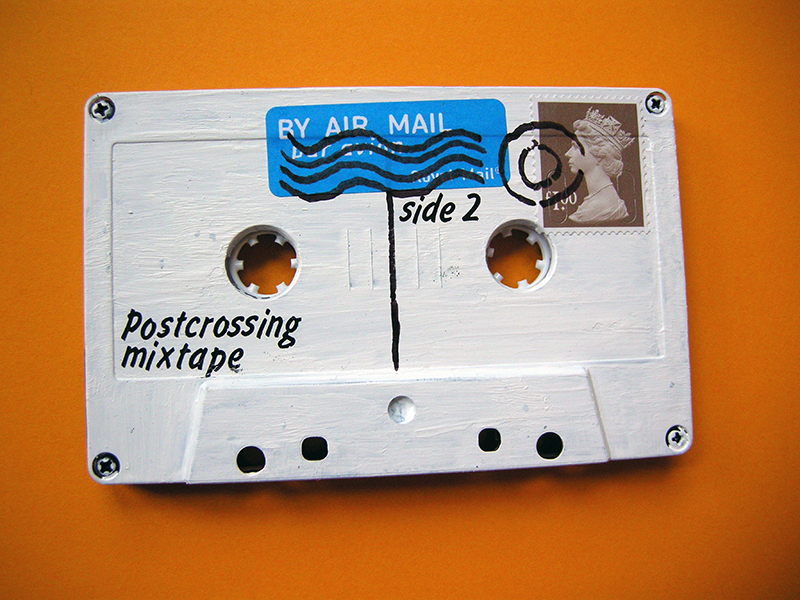 You can find the Postcrossing playlists on Spotify by searching ‘Postcrossing Mixtape’. My Spotify username is p22earl. I hope you enjoy learning about some new music from around the world too. Let me know your favourite song from the playlist. And if you send me a postcard make sure to tell me about the music from your home country / city / town. This is so cool! I want to try it! It looks really interesting and it is a great way to really indulge into the opportunities in the cultures in other countries in my opinion! What a wonderful and unique idea. A lovely way to learn about what is so great about our world. If the whole world could celebrate our differences like this what a much better place it would be for all of us. Good blog! Wonderful!! Postcard give happiness, so does music. Postcards + music = double happiness. Allthough I like silence as well. For my 50th birthday I made my top 50 songs and published it in a comment to a music related card (see userprofile if you are interested). For each song in my list I have sent out a postcard with some lyrics of that song. I received nice happy Hurray! 's for those. I will try this! It's so nice! The reason behind that is that I am trying to create a playlist that will include a song in every language that exist on Earth.. it is not an easy task, it takes time to discover new music which suits one's personal taste. ;-) "
It's an awesome idea! I feel the sharing of love, notwithstanding races and thoughts, through postcards and music. Great idea! May I recommend Rival Sons to any playlist. So I could not contribute to Dagmara's collection. But if it would be ok to name songs of German bands/artists singing in English, I'd be ok, as I come from Hannover I'd be spoilt for choice (Lena, Scorpions, Fury in the Slaughterhouse). Interesting interview. Thanks for sharing your story! Thank you Peter! Music helps feed our Souls and Postcrosser's bring us all more joy. 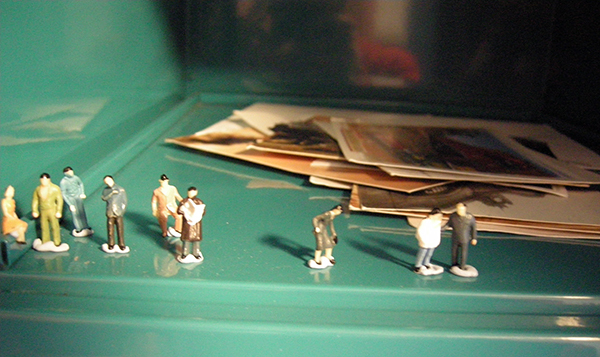 The people in your mailbox is very cool. I also do the same! I put all the favorite songs of Postcrossers in my blog under "Monthly Favorite Songs Corner". For an awesome medieval "kick" try "Die Streuner"... "gotta get it home", for example, is awesome. And even better is to watch matti play it (search for a video). We see them live once a year, twice if we're lucky, and we look forward to it all year long! Ah, how nostalgic to see a mixtape. And so creative! Thank you for sharing this amazing idea. I love it! I also ask people about sharing their favourite music/artist/song with me and I always try to look it up. But I never thought about "collecting" these songs like this. what a great idea, for the record my humans favorite is he ain't heavy he's my brother, she would do anything for her brother. This is so cool. I'm a music teacher and I use postcrossing to learn about different music from around the world too. Thanks for sharing! Great idea and project....I think I will refine my profile a bit to make my request for information more specific...and come up with something similar (won't be music! )...just have to decide which of a couple directions I want to go! This is amazing! Very inspiring, thanks for sharing. I will definitely check out your spotify play list ! This is SUCH a great way to use postrcossing! I love it! But... I cannot find the Spotify? THANK YOU to everybody who has sent responses to me about this project. The feedback has been amazing. 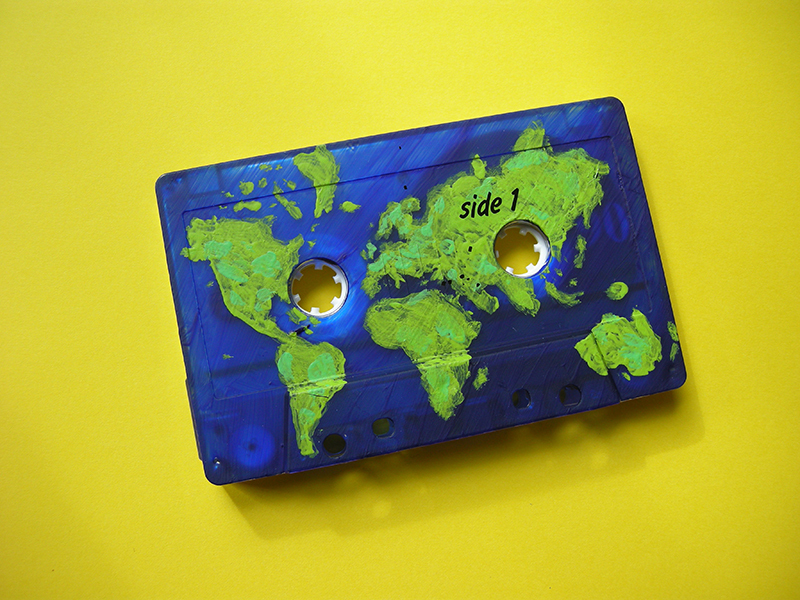 It is lovely to hear how much you are all enjoying the Postcrossing mixtape. I look forward to hearing more of the wonderful music many of you will send me through Postcrossing from all over the world. Happy musical Postcrossing ! Such a cool idea! ♥ I'll definitely listen to those playlists! How cool is this!?!? Peter, I am a DJ on one of the coolest radio stations in the USA, WFHB in Bloomington, Indiana. I've asked people to recommend music for my show & I'm getting some great responses. I'll check out your mix for sure. Great idea!